In late September 2015 I spotted a local news item in my regional paper, Adresseavisen, which is published in the city of Trondheim, Norway. Under the headline “Here we may see a new local billion-kroner industry1” the piece announced the plans and hopes of local politicians in Tydal, a relatively remote valley in the south of the region, to attract the business of Google, Facebook, or similar by building a large data center. The local council’s top business bureaucrat posed for her picture alongside the newly-elected mayor in the middle of a bog which, should the plans go ahead, is likely to disappear in favour of banks of servers. Initially, I found it interesting that the planned data center was billed as “green”, based on the fact that the municipality in which it is to be located is a major producer of hydroelectric power, and the same river which provides the electricity for running the servers is intended to provide cooling water for the plant. Still, as I came to think more carefully about the impact of this center on its immediate surroundings, I was struck by the irony that the electricity-greedy data center would replace a bog, because bogs in fact function as important carbon sinks, storing vast amounts of CO2 and thus keeping it out of the atmosphere (Campbell, 2014; Lund, 2010; Franzén, 2012). By contrast, current estimates credit (or should that be debit?) data centers alone with three per cent of global electricity consumption, expected to rise to a staggering eight per cent by 2020, by which point they will be responsible for discharging an annual load of 340 metric megatons of CO2 into the atmosphere (Chalise, 2015: 1). Despite being powered exclusively by renewable energy, then, a data center built in a bog would never achieve carbon neutrality. Why is any of this relevant to the concept of post-photography? It is significant because data centers constitute a pivotal piece of post-photographic equipment. While smartphones and tablets are the most palpable means by which post-photographic images are made, shared, and stored, such handheld objects are merely the interactive interfaces of a massive yet imperceptible infrastructure. While image-driven digital socializing through the likes of Facebook, Instagram or Snapchat is experienced in a virtual online space, which is accessed through portable wireless devices, it is enabled by racks of plugged-in, stationary servers, located in actual places. Making this infrastructure visible in the metaphorical landscape of post-photography, and raising awareness of its effects on the literal landscapes of natural environments, is the purpose of the discussion that follows. “Post-photography is photography that flows in the hybrid space of digital sociability and is a consequence of visual overabundance. The iconosphere is no longer just a metaphor: we inhabit the image and the image inhabits us.” This quote from Joan Fontcuberta’s introduction to The Post-Photographic Condition (2015: 6) represents post-photography as a condition of contemporary life, where photographic — or perhaps photograph-like — images proliferate, and reproduce themselves, at the most exponential rate yet seen. This post-photographic vitality is sustained through an “iconosphere”. The expression is modelled on scientific terms like atmosphere, denoting the layer of gases that encloses and protects all life on earth, and biosphere, which signifies “the global ecological system intregrating all living beings and their relationships” (Wikipedia), including parts of the atmosphere. The term iconosphere thus conjures up a figurative environment suffused by images, or a metaphorical ecological system encompassing all images and their relationships. Yet Fontcuberta insists that we are now living in a literal iconosphere, where we are in some way able to “inhabit the image” ourselves, whilst images have somehow acquired the capacity to inhabit, in other words to live, in us2. What would it mean to approach this system of images and their relationships as ecological in a non-metaphorical sense? How might we grasp the iconosphere as a natural rather than cultural environment? To what extent could our conceptions of the post-photographic condition benefit from an appreciation of the natural resources and material infrastructures that enable contemporary image practices, and an awareness of the environmental effects that accompany them? I attempt to answer these questions through critical engagement with the techno-architectural form of the data center, since, in my view, it is the most significant materialization of that “hybrid space of digital sociability”, which Fontcuberta identifies as the key site of post-photography. Consider a photograph from the series Below by architectural photographer Christoph Morlinghaus (2011). It shows a cave-like interior, where the ceiling, and what can be discerned of the walls, appear like exposed surfaces of rock. Rows of white lockers are arranged on what looks like a marble-tiled floor, and two black computer screens, seemingly with keyboards attached, are mounted on mobile stands. A chair, also on castors, is visible between two of the rows. Hovering above these installations by the support of a brushed steel structure is a circular glass pod, containing chairs in a black, skeletal design, and a walkway leading to the pod from outside the frame. 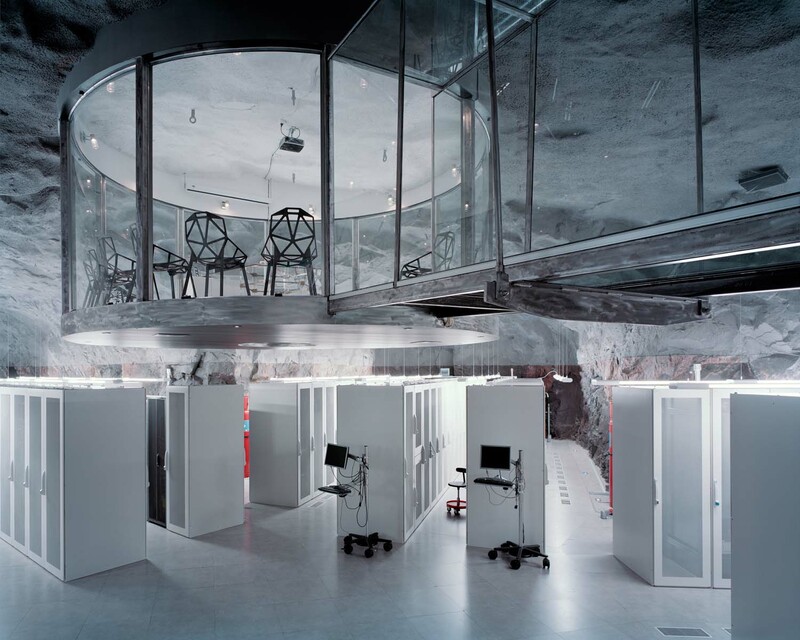 The interior depicted in this photograph is a part of the Bahnhof Pionen Data Center in central Stockholm, which is famous having hosted the data containing the WikiLeaks diplomatic cables in 2010, and for being architecturally reminiscent of a 1960s Bond villain’s lair (McMillan, 2012; Biba, 2011). Owners Bahnhof bill it on their own website as “our famous nuclear bunker in the city of Stockholm”, and boast that it has “repeatedly featured in international media” (2016). Morlinghaus’ photograph of the facility was first published in Wired magazine in 2011, along with other shots from his Below series on underground architecture. 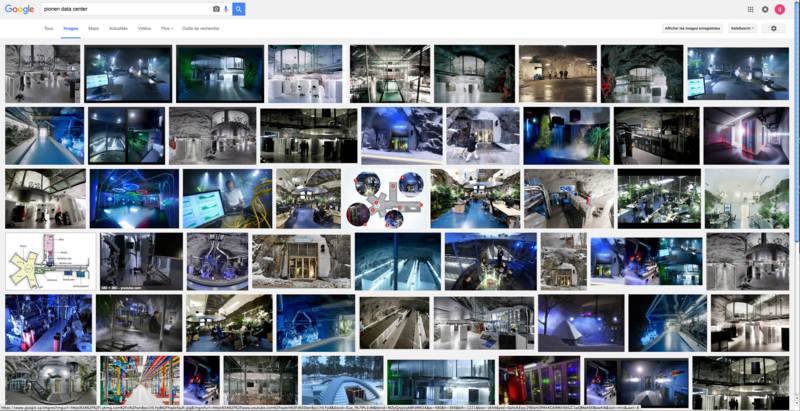 Both Pionen and this particular image of it has since featured in innumerable articles and reports on data centers: a quick Google Image search performed in May 2016 returned at least 55 results on this photograph alone, while a textual search using the words “Pionen Data Center” returned more than 18,000. In one sense, the photograph by Morlinghaus exemplifies “the art of the data center” (Alger, 2012), a trope of digital visual culture that has developed alongside the emergence of so-called cloud computing. A study by Jennifer Holt and Patrick Vonderau, which analyses a selection of such images, argues that they serve to construct “a positive public image of the data center business” (2015: 72), while at the same time “working to conceal or obscure less picturesque dimensions of cloud infrastructure” (2015: 74). With explicit reference to Bahnhof’s own visual promotion of Pionen, Holt and Vonderau highlight the major data traffic caused by unauthorized streaming and file sharing in Sweden, noting that piracy has been a powerful, if rarely admitted, driver of information and communication technology (ICT) expansion and development in that country (74). Images displaying the physical infrastructures of data centers as high-tech temples of hardware offer a false “transparency”, as Holt and Vonderau see it, because they divert attention from the secretive, proprietary, “blackboxed” infrastructures of software that form the other crucial component of networked computing (74). Given the sleek composition and impeccable lighting of the image under discussion, it is tempting to draw an analogy with the kind of architectural magazine photography that banishes all traces of life as lived within the homes depicted. In this visual tradition of interiors devoid of inhabitants, furnished by shiny surfaces giving no clue as to the messiness of their contents, Morlinghaus’ image of Pionen is a perfect picture of the internet “at home”. Following a similar reasoning, Holt and Vonderau argue that spectacular landscape views of data center exteriors, such as the ones provided by Google showing their various facilities across the world (Google, 2016), work to disavow the environmental impact of “storing, processing, cooling, or distributing trillions of gigabytes” by visually implying that “the landscape is even more beautiful because of the giant data center in the picture” (Holt and Vonderau: 75). I am not sure I agree that the visual rhetoric of Google’s self-promotion material is sufficiently persuasive to counteract the impression of natural landscapes spoilt by unattractive industrial installations. Yet I share Holt and Vonderau’s interpretation of the “art of the data center” genre as an eloquent expression of how digital media infrastructures are successfully “hiding in plain sight” (74). Indeed, that capacity is what marks them as infrastructures in the first place. I am aware that my discussion of data centers so far has raised issues which are difficult to pin directly to the post-photographic condition as such. In fact it is virtually impossible, for someone not professionally embedded in the secretive technologies that govern these facilities, to ascertain the amount of data traffic that is explicitly tied to the production and circulation of images and the subsequent ecological impact of these activities. For instance, statistics that might help determine the carbon footprint of Instagram or Flickr, two of the most important photographic platforms on the world wide web, remain hidden within the overall figures for their respective owners, Facebook and Yahoo. Out of these two, Facebook seems to be the slightly more committed to greening its server farms by replacing “coal-fired computers” (YoHa, 2010) with renewable energy supplies. According to Greenpeace’s most recent Clicking Clean Report, published in May 2015, Facebook was on track to reach its “aim to be 25% renewably powered by the end of 2015”, which is to say one-fourth on the way to meet its ultimate target of a 100% renewable power supply (Cook and Pomerantz, 2015: 24). The flagship of Facebook’s server farm fleet in this respect is its major facility located in Luleå, Northern Sweden, which runs exclusively on hydroelectric power, and benefits from the cold climate there to regulate the heat generated by its servers (Hogan, 2015: 12; Holt and Vonderau: 84). The natural environment of Sweden has moreover been actively promoted as especially hospitable to the data center industry, as a study by Peter Jakobsson and Fredrik Stiernstedt has shown (2012). Their analysis of Scandinavian data center discourse, as it emerges in anything from promotional material via policy documents to server farm architecture, found that stability on a geological as well as historico-political scale constitute the key selling points of data centers in Sweden and Finland (Jakobsson and Stiernstedt: 105). Significantly, the Bahnhof Pionen Data Center is among the specific facilities they discuss (110-113). This appears a further indication of the emblematic status this particular server farm has achieved in critical literature as well as in boosterish discourse on data centers. One reason for this is clearly the conscious promotion of the site by Bahnhof, which also runs several other, less spectacular, data centers in Sweden. Another explanation may be connected to the “soft infrastructures” (Peters, 2015: 32) of search algorithms on the internet, summarized by the term “search engine bias”, which in Elizabeth Van Couvering’s terms denotes “systematic bias towards classes of websites and specific exclusion or censorship of particular websites” (2012: 118). In other words: once a picture of a data center like Pionen has been published on a type of website favoured by a search engine like Google (in which category the tech bible Wired.com must surely belong), it is likely to be more readily found and used again, which then further heightens its search engine visibility, and so on. Such are the digital economics of the post-photographic condition. 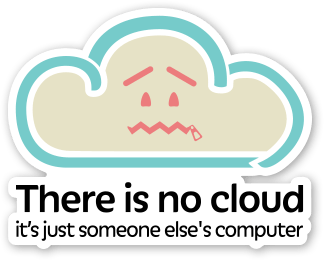 “There is no cloud”, as the popular sticker says, “it’s just someone else’s computer” (Stickermule). The wisecrack encapsulates a disenchantment with the way biological, ecological and environmental metaphors serve to obfuscate the material, technological and economic realities of contemporary digital culture. This disenchantment is increasingly growing within the field of media studies, where metaphorical (ab)uses of ecological terminology have been entrenched since the 1960s. Academics have deployed terms like environment, ecology and ecosystem as explanatory models for how media forms and formats “interact, live, die and engender cultural norms” (Maxwell, Raundalen, and Vestberg, 2015: xii). Similarly, marketers of consumer electronics have appealed to the same set of connotations when presenting new gadgets as ever more adapted organisms in an inexorably evolving electronic ecosystem (Maxwell and Miller, 2015: 94). Here Apple’s product range is the textbook example, encompassing as it does both hardware and software (Jackson, 2014). One explanation for how the idea of studying media as environments emerged, is that it functioned “as a heuristic device to help establish a niche for humanistic approaches to media and communication studies in North American universities” (Maxwell, Raundalen, and Vesbterg: xii). The founding fathers of this ecological approach to media studies are usually identified as the Canadian literary scholar Marshall McLuhan (1911-1980), representative of the so-called Toronto School, and the US educationalist Neil Postman (1931-2003), ditto of the New York School3. Regardless of origin or motivation, the metaphorical understanding of ecology has had lasting purchase within media studies, and its dominance may have contributed to delaying realisation of the actual ecological impact of media production and consumption among media researchers4. In recent years, this tendency has been challenged, notably by Richard Maxwell and Toby Miller, who in their 2012 book Greening the Media called specifically for the emergence of a “materialist ecology” of media (9). Maxwell and Miller have in particular voiced concern over the ecological impact caused by accelerating consumption of new media hardware, from smartphones via laptop computers to flat screen television sets, all designed with so-called planned obsolescence. This means devices are practically programmed to require replacement within two to three years of purchase, at which point the manufacturer has a new and further “evolved” version of the gadget ready for release into the figurative media-technological ecosystem. The cycle of consumption produces a significant waste problem in the shape of discarded pieces of hardware, the recycling of which is both complicated, on account of the rare earths, precious metals and synthetic compounds that make up each device, and toxic to the often unprotected recycling workers exposed to them. The same concerns are frequently raised about the processes involved in the production of new electronic devices, where the same materials and chemicals are handled under hazardous working conditions that have also frequently been revealed as undignified. The materialist media ecology outlined by Maxwell and Miller has been particularly focused on these aspects of contemporary media consumption. Their approach is relevant to an eco-ethical exploration of the post-photographic condition on account of its attention to the material properties and environmental effects of the individual devices — smartphones, tablets, laptops, etc. — through which we make, view and share post-photographic images on an everyday basis. Yet this article is less concerned with the smartphone as post-photographic interface than with the data center as post-photographic infrastructure. In this respect it takes inspiration from recent work on the material conditions of contemporary media culture which have billed themselves as “critical studies of media infrastructures” (Parks and Starosielski, 2015) or even “infrastructuralism” (Peters, 2015: 30-38). These approaches share with Maxwell and Miller a commitment to attend critically to the “stuff” (Parks, 2015) which media are made of, and some concern about the environmental cost of producing, maintaining, and disposing of it. Significantly, however, they do not blame McLuhan and the metaphorical media ecologists for media studies’ lack of materialist ecological awareness. It is therefore possible for John Durham Peters, for instance, to enlist McLuhan’s observations on the environmental character of media very productively in his own groundbreaking study, The Marvelous Clouds. Toward a Philosophy of Elemental Media (2015). This book, which is already approaching the status of a classic, combines McLuhan’s idea that “media work as environments” (McLuhan and Fiore, 1967: 26) with Friedrich Kittler’s observation that “media determine our situation” (cited in Peters: 26) in order to argue that “environments are also media” (Peters: 3). Indeed, Peters provides a compelling case for assuming that not only humans but also animals experience and exploit their respective environments as mediating forces and means of communication5. In the section outlining the concept of infrastructuralism, he specifies that his own project shares McLuhan’s overarching commitment “to make environments visible” (Peters: 38). Peters further signals his indebtedness to McLuhan by recycling the title of the latter’s best-known book, Understanding Media (2001 ), as the opening chapter’s heading, and glosses his own term, “infrastructural media”, as a pun on that very title, in the meaning “media that stand under” (Peters: 33). In the way punning works, this move effectively exposes the linguistic infrastructure of the term “understanding”. This in turn creates a new metaphor — a new image — which to my mind is concretized in Morlinghaus’ photograph of Pionen: here stand the servers, i.e. the media, quite precisely, under. And hovering above them, like a cloud, is the glassy and transparent conference room. Both of which are encased within that most ancient of environments and infrastructures, namely, bedrock. Not only does the photograph provide a visualization of server racks as “under-standing media” in Peters’ sense, then: it also works as a visual analogy of the data center industry’s own discourse on data storage, which, as Jakobsson and Stiernstedt show, tends to emphasise the material solidity and durability of mountains and bedrock rather than the metaphorical ephemerality and movement of clouds and currents. The global iconosphere may appear as intangible as the gaseous atmosphere, but it is in fact sustained by the solidity of server farms. These are in turn connected to electric grids and fibre optic cable networks. An important purpose of studies like those made by Holt and Vonderau; Jakobsson and Stiernstedt, and others, has been to draw attention to this fact, and to problematize political, social and environmental issues arising from them (see for instance Hogan, 2015). The same objective is shared by the present study. Yet one important question arising from the critical discourse on data centers, namely, “what can possibly be done about it?”, still tends to be evaded. One early article on the ecological impact of cloud computing implied that some form of information rationing might sooner or later impose itself (Cubitt, Hassan, and Volkmer, 2011), but generally the academic community of media studies is wary of making normative statements or recommendations. The present article will not prove an exception to this rule, however I consider it worth exploring what it might be that stands in the way of asking, let alone answering, this question. The infrastructural services of cloud computing define everyday life in the global north, even for those who may not be aware of it (Holt and Vonderau: 72). The cloud permeates every activity from shopping, banking, and online dating, to office cleaning (ticking off each room on a tablet as you go), cooking dinner (from an online recipe), or organizing a party (using a getting-things-done application). From the point of view of those who are cognisant of such activities as instances of “electronic energy consumption”, the challenge is how to change behaviour in the direction of less resource-intensive “energy practices” (Gabrys, 2015: 9). The problem standing in the way of overcoming that challenge, however, is the fact that people doing all of those things are not seeing themselves as consuming energy. People filling up their corner of the cloud with (post-)photographic images, for instance, may be recording special moments; communicating with loved ones; taking time out from a dreary job; trying to improve their visual skills, or all of the above. They are not thinking of themselves as wasting electricity, let alone contributing to climate change, nor are they likely to start doing so. It is therefore doubtful that any amount of consciousness-raising on the level of individual imaging practices — or ditto banking, shopping, and dating practices, for that matter — will have a discernible impact on the carbon footprint of data centers. This is not an argument for leaving everything to laissez-faire, it is a spur to approach the challenge from another angle. Re-enter McLuhan. I have previously concurred in the assessment that the metaphorical media ecology derived from McLuhan’s environmental media theories has been an obstruction to understandings of media, and their enabling technologies, as ecologically significant in a material sense. This was forcefully argued in a co-authored introduction to a recent collection of essays, Media and the Ecological Crisis (Maxwell, Raundalen, and Vestberg, 2015). Since then, I have been inspired by two other writers, Kenneth Allan (2014) and the above-cited Peters (2015), to read McLuhan again, and to read other pieces by him. This has led me to re-cast him, at least in my own geneaology of media ecology, as more of a supportive character than a villain. Even half a century on from his heyday, I find, like Peters, that it is worth listening to McLuhan’s “call to awareness” of the “technological habitats” in which we spend our lives (Peters: 38). For McLuhan, imperceptibility was what defined the environmental character of media, and much of his career was spent either drawing attention to this fact or entreating others to do so. In particular, the media theorist saw a crucial role for artists as producers of what he termed “antienvironments, or counterenvironments, created to permit perception of environments” (McLuhan, 1997 : 225). As Allan has argued, “the revelation of underperceived environments [is what] defines McLuhan’s notion of art” (36). The wide dissemination of McLuhan’s ideas across academic and art institutions in the 1960s, meanwhile, makes the concept of counter- or antienvironments especially pertinent to historical investigations of North American artworks from that period, which are more commonly associated with “institutional critique” (Allan: 23). 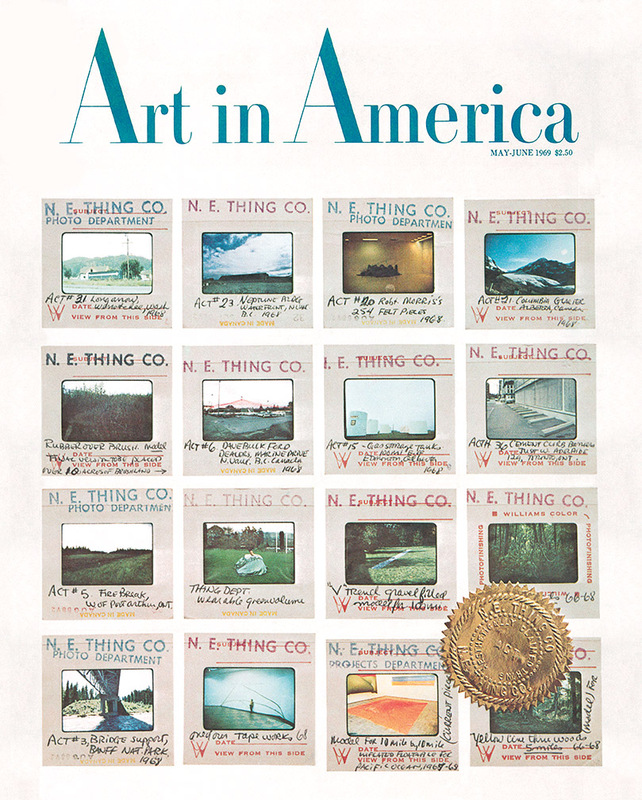 A central example in Allan’s study is the magazine cover for the May-June 1969 issue of Art in America, which featured work by Canadian artists N.E. Thing Co. Ltd. in the form of a slide sheet containing 35 mm photographic colour transparencies. Each transparency, or slide, in everyday language, was individually mounted, and the mounts were furnished with the stamped logo “N. E. Thing Co.”, some with another stamp beneath reading “Photo Department”. The mounted photographs, showing various objects and landscapes captured by the artists, had additional handwritten captions labelling them ACTs (“Aesthetically Claimed Things”), and occasionally giving information on the depicted object or location. The important point made by Allan is that in the 1960s, such slides and slide sheets were instrumental objects in “the circulation of art-world information, but they were viewed only by professionals engaged in their organizational activities” (34). By revealing to the Art in America readership (inadvertently, as it turns out) “an invisible component of art-world environmental information”, the magazine lifted a lid on the infrastructures of the then-contemporary art world, and as such “operated as an art-world counterenvironment” (34). The point of this brief detour into recent art history is twofold: first, it is to offer the N.E. Thing Co. slide sheet as an instance of “infrastructural art”, to paraphrase Peters, which materializes the photographic condition of the mid- to late-twentieth century quite as eloquently as the Morlinghaus Pionen photograph depicts the post-photographic condition of the 2010s6. Second, it is to illustrate the usefulness of McLuhan’s concept of the counter- or anti-environment, both as a strategy for artists and other image-makers engaged in some form of critical practice, and as a methodological tool for theorists seeking to account for the significance of works that succeed in making environments visible. In this article I have chosen to use Christoph Morlinghaus’ image of Pionen as the visual leitmotif for a discussion of data centers for that very reason: it creates, in my view, a post-photographic counterenvironment precisely through the way it visualizes a defining infrastructure of the post-photographic environment. Whichever technological environment is currently dominant remains almost per definition out of view, according to McLuhan. At the same time he claimed that, “if the new environment is invisible, it does serve to make very visible the receding environment.” (1997 : 221.) It is tempting to extrapolate from this statement that the very act of making an environment visible could potentially have the effect of making it recede. That might possibly hold true for some environments (one thinks of people amending their looks after being confronted with an unflattering image of themselves) but it is patently not going to be the case with data centers and their attendant infrastructures. Only as this article was being completed, Facebook and Microsoft announced a joint venture “to build private internet highway under water”, as the Guardian phrased it, in its report on the companies’ plans to install their own undersea cable from the US east coast to the northern coast of Spain (Yadron, 2016). The mounting pressure of data traffic in existing undersea cables is directly attributable to cloud computing practices, as Nicole Starosielski has observed (2015: 67). The Facebook cable stretching across the Atlantic Ocean floor is in this sense just another extension of the material social network: a symptomatic piece of environmental media that is invisible by virtue of the natural environment in which it is, literally, embedded. Here the materiality of the iconosphere runs into the medium of the hydrosphere. After the metaphorical cloud has been vaporized to reveal the subterranean server infrastructures it conceals, the time may soon come to create a counterenvironment of the subseas. It remains to see what post-photography might have to contribute to that process. 2. This idea resonates with important strands of thinking within the field of visual culture over the past decade or more, exemplified by W.J.T. Mitchell’s work on images as life forms (2005) and clones as living images (2011). 3. A historical overview of the movement and a comprehensive bibliography of research and literature representative of this scholarly tradition is available on the Media Ecology Association website, at: http://www.media-ecology.org. 4. For instance, Matthew Fuller's book Media Ecologies. Materialist Energies in Art and Technoculture (2005), whilst explicitly stating a materialist agenda, remains metaphorical in its use of the word ecology. For a more detailed critique of metaphorical media ecology, see Maxwell and Miller (2015: 87-98). 5. Peters launches this argument through a fascinating exploration of cetacean communication in and through the sea, using the common comparison of human and dolphin brains as the starting point for a thought experiment from the point of view of creatures living in, and communicating through, sea water. See “Of Cetaceans and Ships, or, The Moorings of Our Being”, (Peters, 2015: 53-115). 6. The term depict is chosen wisely: Morlinghaus is committed to emulsion, and his Pionen picture is not therefore a fully-fledged post-photographic image but a bona fide photographic image, shot on 4 x 5” colour transparency film. Personal communication from agent (31 May 2016). See also Zavos (2009). Alger, Douglas. 2012. The Art of the Data Center. A Look Inside the World’s Most Innovative and Compelling Computing Environments. Upper Saddle River, NJ : Prentice Hall, 360 p.
Allan, Kenneth R. 2014. « Marshall McLuhan and the Counterenvironment. ‘The Medium is the Massage’ ». Art Journal, vol. 73, no 4, p. 22-45. [s. a.]. [s. d.]. « Her kan det komme en ny trøndersk milliardindustri ». Adresseavisen. [s. a.]. 2016. « Pionen — our famous nuclear bunker in the city of Stockholm ». Bahnhof.net. Biba, Erin. 2011. « Underground Caverns Keep Things Cold, Safe… and Secret ». Wired, 31 janvier. Campbell, David I. 2014. « Year-round growing conditions explains large CO2 sink strength in a New Zealand raised peat bog ». Agricultural and Forest Meteorology, vol. 192-193, no 59-68. <https://www.sciencedirect.com/science/article/pii/S016819231400063X>. Consultée le 12 septembre 2016. Chalise, Santosh. 2015. « Data center energy systems. Current technology and future direction ». Power & Energy Society General Meeting, juillet, p. 1-5, 26-30. Cook, Gary et David Pomerantz. 2015. Clicking Clean. A Guide to Building the Green Internet. Washington (DC) : Greenpeace, 72 p. <http://www.greenpeace.org/usa/wp-content/uploads/legacy/Global/usa/planet3/PDFs/2015ClickingClean.pdf>. Consultée le 12 septembre 2016. Cubitt, Sean, Robert Hassan et Ingrid Volkmer. 2011. « Does Cloud Computing Have a Silver Lining? ». Media, Culture and Society, vol. 33, no 1, p. 149-158. Gabrys, Jennifer. 2015. « Powering the Digital. From Energy Ecologies to Electronic Environmentalism », dans Richard Maxwell, Jon Raundalen et Nina Lager Vestberg (dir. ), Media and the Ecological Crisis. Londres : Routledge, p. 3-18. [s. a.]. 2016. « Where the Internet Lives. 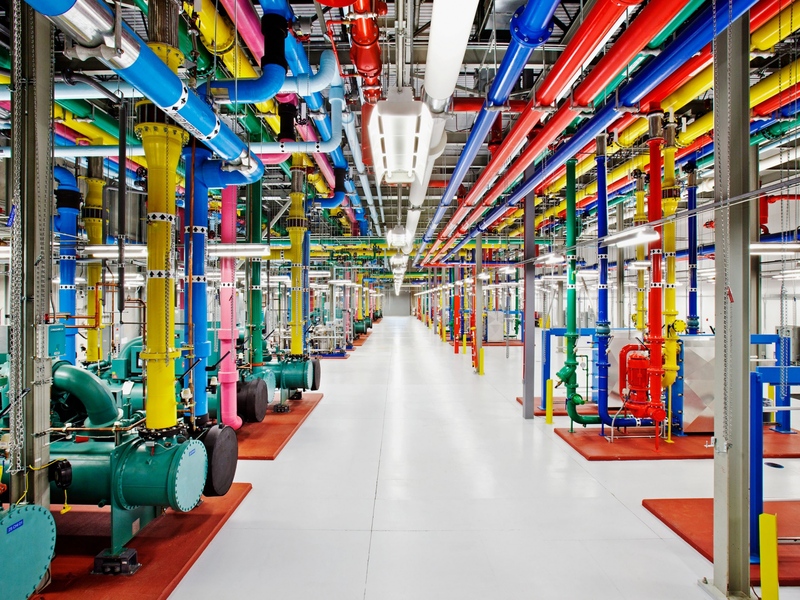 Take a Look Inside Google’s High-Tech Data Centers ». Google.com. Fontcuberta, Joan. 2015. The Postphotographic Condition. Montréal : Le mois de la photo à Montréal, 176 p.
Franzen, Lars G. 2012. « The Potential Peatland Extent and Carbon Sink in Sweden, as related to the Peatland/Ice Age Hyopthesis ». Mires and Peat, vol. 10, p. 1-19. <http://pixelrauschen.de/wbmp/media/map10/map_10_08.pdf>. Consultée le 12 septembre 2016. Fuller, Matthew. 2005. Media Ecologies. Materialist Energies in Art and Technoculture. Cambridge, MA : MIT Press, 265 p.
Holt, Jennifer et Patrick Vonderau. 2015. « Where the Internet Lives’. Data Centers as Cloud Infrastructure », dans Lisa Parks et Nicole Starosielski (dir. ), Signal Traffic. Critical Studies of Media Infrastructures. Champaign, IL : University of Illinois Press, p. 71-93. Jackson, Eric. 2014. « Apple Isn’t a Hardware or Software Company, It’s an Ecosystem Company ». Forbes.com, 3 juin. Jakobsson, Peter et Frederik Stiernstedt. 2012. « Time, Space and Clouds of Information: Data Centre Discourse and the Meaning of Durability », dans Goran Bolin (dir. ), Cultural Technologies. The Shaping of Culture in Media and Society. New York; London : Routledge, p. 103-117. Lund, Magnus. 2010. « Variability in exchange of CO2 across 12 northern peatland and tundra sites ». Global Change Biology, vol. 16, no 9, p. 2436-2448. Mawell, Richard et Toby Miller. 2012. Greening the Media. Oxford : Oxford University Press, 246 p.
Maxwell, Richard et Jon Raundalen. 2015. Media and the Ecological Crisis. New York; London : Routledge, 228 p.
McLuhan, Marshall. 1997 . « Address at Vision 65 », dans Eric McLuhan et Frank Zingrone (dir. ), Essential McLuhan. Londres : Routledge, p. 219-232. McLuhan, Marshall. 2001 . Understanding Media. The Extensions of Man. Londres : Routledge, 400 p.
McLuhan, Marshall et Quentin Fiore. 1967. The Medium Is the Massage. New York : Random House, 157 p.
McMillan, Robert. 2012. « Deep Inside the James Bond Villain’s Lair That Actually Exists ». Wired, 21 novembre. Mitchell, William John Thoma. 2005. What Do Pictures Want? The Lives and Loves of Images. Chicago : University of Chicago Press, 380 p.
Mitchell, William John Thoma. 2011. Cloning Terror. The War of Images, 9/11 to the Present. Chicago : University of Chicago Press, 209 p.
Parks, Lisa. 2015. « ‘Stuff You Can Kick’. Toward a Theory of Media Infrastructures », dans Patrik Svensson et David Theo Goldberg (dir. ), Between Humanities and the Digital. Cambridge, MA : The MIT Press, p. 355-373. Parks, Lisa. 2015. Signal Traffic. Critical Studies of Media Infrastructures. Champaign, IL : University of Illinois Press, 304 p.
Peters, John Durham. 2015. The Marvelous Clouds. Toward a Philosophy of Elemental Media. Chicago : University of Chicago Press, 410 p.
Starosielski, Nicole. 2015. « Fixed Flow. Undersea Cables as Media Infrastructures », dans Lisa Parks et Nicole Starosielski (dir. ), Signal Traffic. Critical Studies of Media Infrastructures. Champaign, IL : University of Illinois Press, p. 53-70. Watterston, Chris. [s. d.]. « There Is No Cloud ». Stickermule. <https://www.stickermule.com>. Consultée le 12 septembre 2016. Van Couvering, Elizabeth. 2012. « Search Engines in Practice. Structure and Culture in Technical Development », dans Goran Bolin (dir. ), Cultural Technologies. The Shaping of Culture in Media and Society. New York; London : Routledge, p. 118-132. Waters, Colin N, Jan Zalasiewicz, Colin Summerhayes, Anthony D Barnosky et al.. 2016. « The Anthropocene is functionally and stratigraphically distinct from the Holocene ». Science, vol. 351, no 6269. <http://science.sciencemag.org/content/351/6269/aad2622>. Consultée le 31 mai 2016. Yadron, Danny. 2016. « Facebook and Microsoft to build private internet highway under water ». The Guardian, 26, mai, 2016. <https://www.theguardian.com/technology/2016/may/26/facebook-microsoft-internet-cable-underwater>. Consultée le 31 mai 2016. [s. a.]. 2010. « Coal-Fired Computers ». YoHa. <http://yoha.co.uk/cfc>. Consultée le 7 janvier 2016. Zavos, Alison. 2009. « Stunning Architectural Photographs by Christoph Morlinghaus ». feature shoot, 20 janvier.